This will be a quick post (have my MIL visiting and not much time to craft!). I just wanted to share the last page of my December Daily. 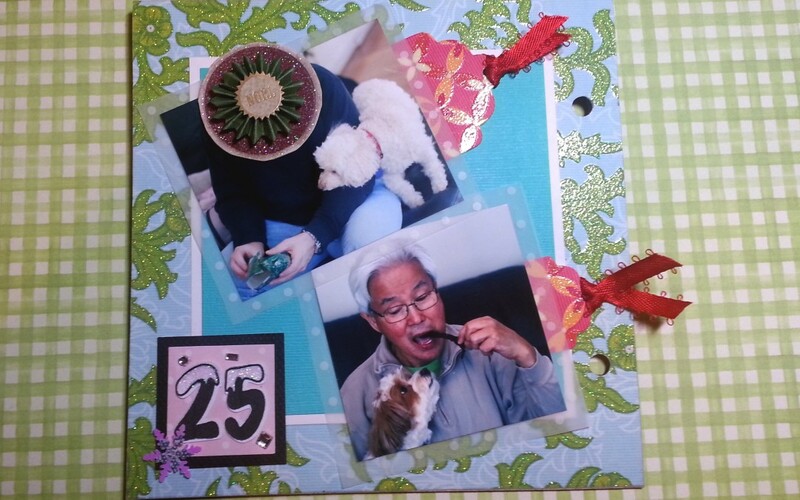 This is a simple page with just a couple of pictures of favorite Christmas day moments and a little journaling. The top photo is of my hubby opening up a present (his face is covered to protect his anonymity), with Biscuit overseeing progress. I thought this was so sweet because in our family we normally don’t give gifts to adults, but my niece (who is a sophomore in college) insisted on getting gifts for me and my hubby. She is really growing up into a fantastic young lady. I thought this picture was especially funny because my hubby was opening a package of chocolate covered biscotti, and Biscuit was so very interested. Diemond Dies is having a sale through Dec 31, 2014 and you can layer on my coupon code: thankskristina for an extra 10% off plus free worldwide shipping! What a fun page! Your Daily will be such fun to look back on! Thanks for joining us at the Simon Says Stamp Wednesday challenge!